View of the interior of one of the buildings that date to the Assyrian Period (7th century B.C.) that was found at Tell Jemmeh—about 8 mi. south of Gaza. Note the mud–brick walls that were covered with a mud coating. The doorway is about 5 ft. high (at the most). Note especially, in the upper left of the image, the beginning of the mud–brick voussoirs of the very early mud–brick vault! 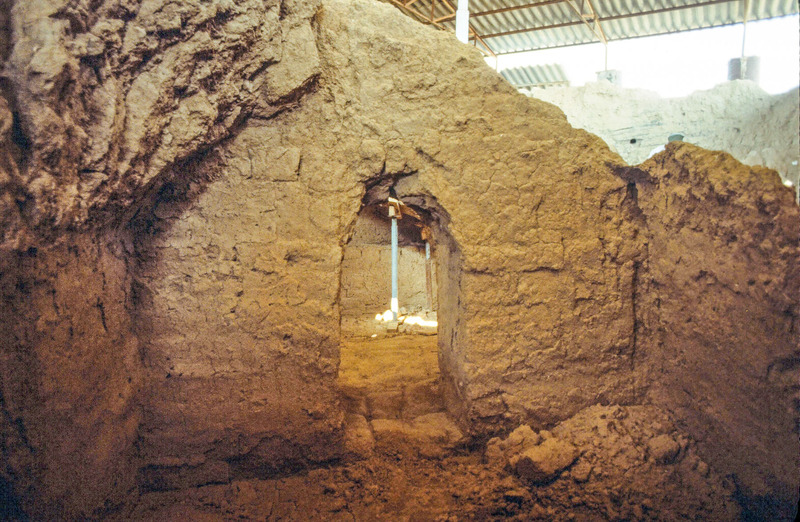 The excavator believes that these 6 rooms were actually the basement of a large Assyrian Palace that sat on top of them—thus the vaulted rooms supported the palace above. If this is so, then the great Assyrian ruler, Esarhaddon may have actually stayed in this palace (2 Kings 19:37; Ezra 4:2; Isa 37:38)! “. . . is one of the most remarkable structures ever found in Israel because it preserves vaulted mud-brick ceilings that were erected with keystone-shaped bricks, or voussoirs, marking the earliest known use of voussoirs in world architecture” (p. 670). Unfortunately the protective sheet–metal roof was ripped off, by winds, and all of these structures have been destroyed as they have been exposed to the rains. Tell Jemmeh (also called Tel Re’im and T. Gamma) is often identified with ancient Yurza. It is a large mound on the southern bank of the Nahal Besor (Wadi Ghazzeh). It was excavated in the 1920’s by two expeditions including one led by Sir Flinders Petrie. In addition it was excavated in the 1970’s by the late G. W. Van Beek. Numerous archaeological periods are represented at the site but there were outstanding finds from the late Iron Age and Hellenistic Period. Tell Jemmeh is located about 8 mi. 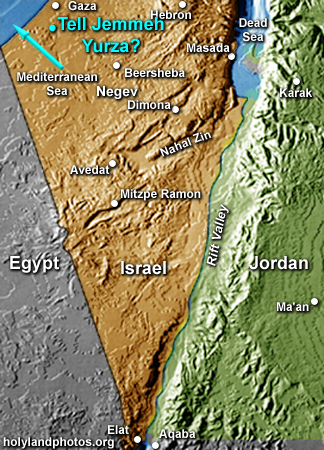 south of Gaza and served as a transit point heading into and out of Egypt to the west-southwest. It is very possible that the Assyrians mustered their troops here prior to their invasions of Egypt during the days of Esarhaddon (7th century B.C. ).